The Black Cat team has now returned to the UK following a successful Musikschulkongress 2015. 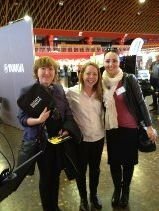 Alice Dagger, UK Marketing Manager reported: “As usual, the conference was very well organised, and we enjoyed participating in the exhibition. It is always a pleasure to meet and chat to German music school teachers, whose passion for teaching and playing music is inspiring.” Dirk Rueter, Manager of the Berlin office, added: “We enjoyed Musikschulkongress and it was a pleasure to visit Münster. We look forward to attending Musikschulkongress 2017 in Stuttgart!” Black Cat Music displayed a selection of its range of high quality music equipment ranging from the world-renowned Wenger music stands, ergonomic music posture chairs and staging to sound-isolating music practice rooms and self-build sound-isolating AcoustiCabins.